Katarina Zarutskie photos: Did Instagram model risk swimming with sharks for extra followers? Pictured, Instagram model, Katarina Zarutskie. At what price followers? Instagram model, Katarina Zarutskie attacked by a shark in Bahamas during photo shoot in which she denies ‘stunt’ in bid to gain extra followers. 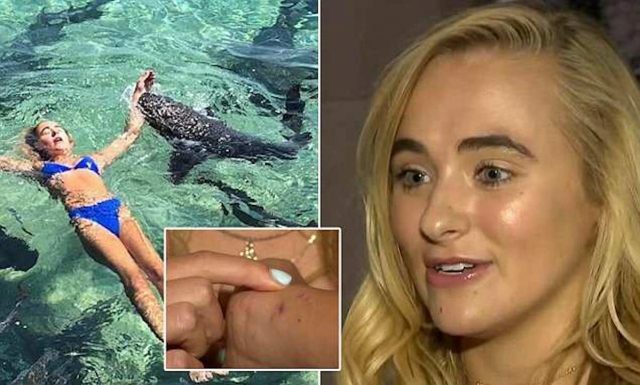 An Instagram model from California has told of having an ‘amazing experience’ after nearly being a victim to a shark attack during a photo shoot in the Bahamas. It all happened while Katarina Zarutskie, 19, a nursing student from Laguna Beach and aspiring social media star was on holidays in the Exuma Islands with her boyfriend and his family when she found out about locals swimming with nurse sharks and thinking it would be ‘fun’ (and ‘safe’) to try. 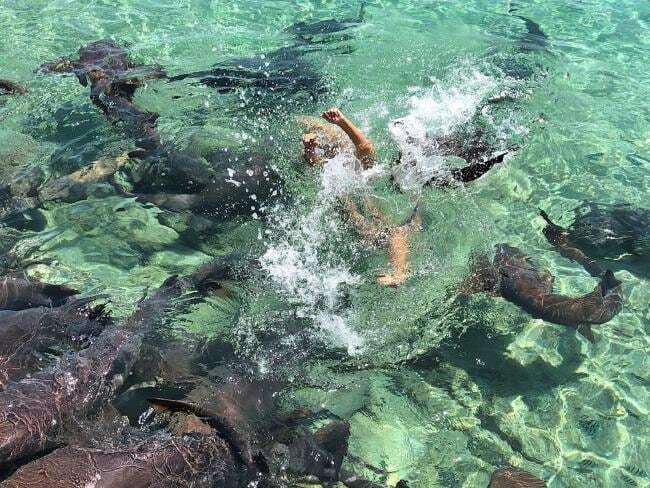 ‘My boyfriend’s family was freaking out when I went to swim with the sharks and I was like, ‘It’s fine,’’ Zarutskie, a nursing student at the University of Miami, told via NBC News. But it wasn’t exactly fun and nor was it very safe either. Following a few minutes of posing in the water, Zarutskie was encouraging to lie back and float in the water, where the occasional nurse shark was flitting away (cause who doesn’t like increasing the social media stakes and nailing ever more daring photos to be the envy and following of….). Easier said than done. Or nearly. ‘At this point people were starting to take photos and right as I lay back,’ Zarutskie told via the BBC. 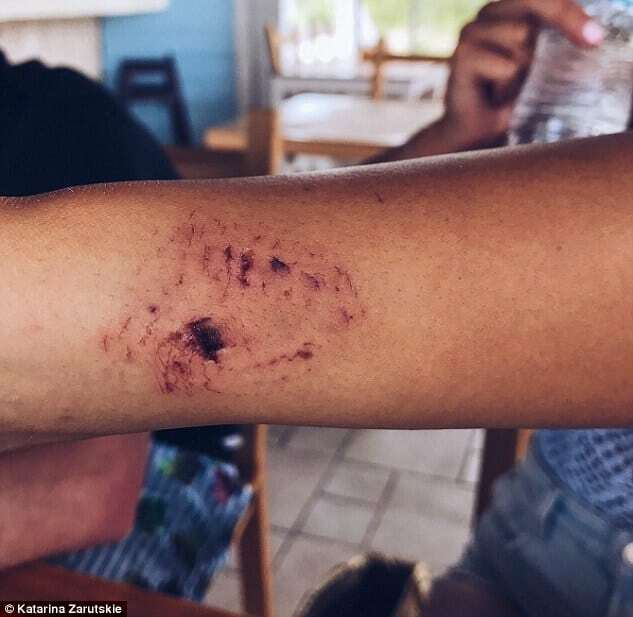 Her boyfriend’s dad, who was snapping pictures, captured the moment a 1.5m shark sunk suddenly sunk its teeth in the Instagram model’s hand. The resulting photographs show Zarutskie covering her wound and raising her arm in an effort to stop the blood spreading in the water. Told Zarutskie, ‘At that point your body has so much adrenaline going and you just have to get out of the situation, but I stayed extremely calm’. Rather than panicking and managing to keep blood from permeating in the water and alerting other sharks, Zarutskie was able to swim towards nearby steps and scamper out where she had to have stitches for her bite injury. Despite being given antibiotics, the Instagram model with 45k followers decided to fly to Florida the next day for further treatment. “[The doctors] now believe that I still have pieces of the shark teeth in my arm and I will forever have a scar,’ Zarutskie said, concerned that the injury could affect her modeling career. Katarina Zarutskie instagram model: Did she risk stunt for fame and followers? For added verification, Hocher pointed to sign at the marina warning guests that nurse sharks ‘can and do bite’ — and that visitors who want to swim with them must do so at their own risk. Not that there aren’t many takers- judging from the immediately above Youtube video. Zarutskie for her part claims not having seen the sign (never mind common sense) while conceding that she had been advised against swimming with the sharks. ‘Against my boyfriend’s wishes and his parents’ wishes. They were just screaming at me not to do it,’ the teen said. The incident has since led to the Instagram star denying she performed the stunt in a bi to gain Instagram followers. ‘They took the information they wanted and really spun the story in a way that I’m a stupid blond Instagram model,’ Zarutskie told the BBC. Asked if she’d swim with the sharks again, Zarutskie said she had no regrets. Katarina Zarutskie- daredevil Instagram star? Katarina Zarutskie shark bite injury. Katarina Zarutskie with her boyfriend.